The banana bread pudding recipe below uses simple ingredients and is very easy to prepare. If you are having guests at home and don’t have much time to prepare an elaborate dessert, then the two simple ingredients banana and bread can give you a delicious dessert in minutes. 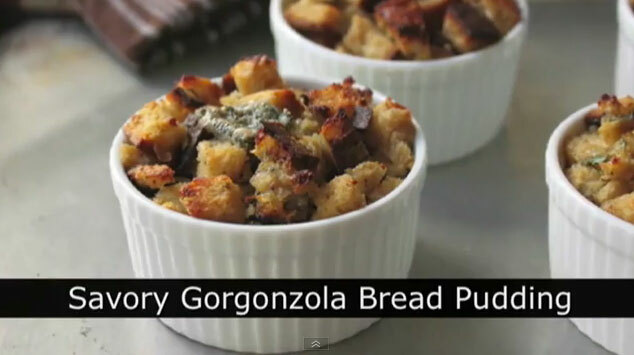 Here’s a simple bread pudding recipe for you. In the meantime, remove the crust from the bread slices, cut the bread in thin stripes, and keep aside in open air. Peel and slice the bananas lengthwise and cut them crosswise to get six thin pieces out of each banana. In a flat pan, melt 2 tablespoons of butter and add 2 tablespoons of sugar. When the sugar starts to caramelize, fry the bananas until they are tender and slightly caramelized. In a deep bowl, break the eggs and whisk until fluffy. Add vanilla extract, 2 cups of whipping cream, remaining sugar, and whisk well. Add banana pieces to this and mix. Take a 9 ½ inch baking pan. You may use a deep glass dish so that you can serve in the same. Arrange about ⅓ of the bread stripes at the bottom of the dish in a crisscross pattern. Arrange ½ of the banana slices on top of the bread slices and pour half of the egg and cream mix evenly over the top. Sprinkle some raisins and pecans on top. Arrange another ⅓ of the bread slices over the top and repeat the banana and cream layer. Arrange the rest of the bread slices as a final layer and press very lightly to set everything. Let it stand for 20 minutes so that the bread absorbs the liquid. Bake the pudding in the oven for 45 minutes until light and golden on the top. Let cool and prepare the sauce. For the sauce: melt the butter, cream, dark brown sugar and salt in a pan. To serve, cut a slice out of the bread pudding and drizzle some sauce over it.